Aircraft cabin lighting specialist, STG Aerospace, is delighted to announce that as part of its CSR programme it has chosen Orbis to be its official company charity. Orbis changes the way the world sees by preventing and treating avoidable blindness and visual impairment. They train and mentor local eye care teams, educate communities, and partner with hospitals, NGOs and governments to save sight and transform lives around the world. 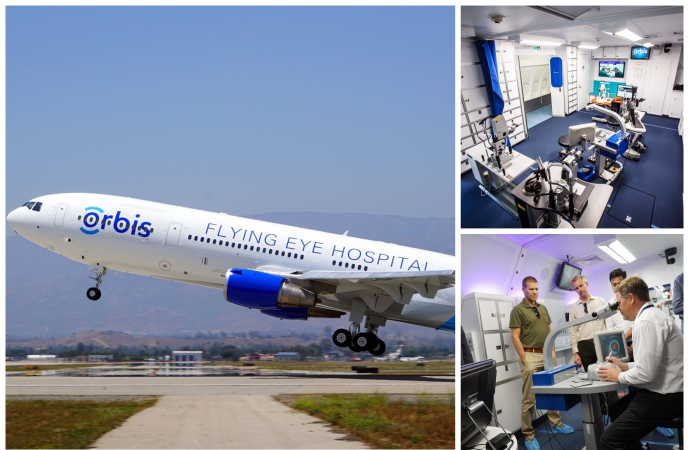 Orbis represents a non-profit alliance between the medical and aviation industries, operating the world’s only ophthalmic teaching hospital on board a customised MD-10 aircraft. With its converted McDonnell Douglas DC-10-30CF – already equipped with STG Aerospace’s saf-Tglo® emergency floor path marking system – Orbis transports the most advanced ophthalmological knowledge, surgical skills and facilities across Africa, Asia and Latin America. By equipping local eye care teams with the skills to treat eye conditions, such as cataract, and training others to do the same, Orbis leaves a comprehensive and sustainable legacy of high-quality care. As part of its programme of support for Orbis, STG Aerospace has already organised a number of fundraising events at its Innovation & Engineering Centre in Cwmbran, including a sponsored Christmas Event for its staff and a Welsh Charity Walk. In addition, instead of sending out company Christmas cards this year, STG Aerospace will be donating the money it would have spent straight to Orbis.